Jonathan Bloom writes the food blog Wasted Food. He is also writing a book on wasted food in America. In this two part interview, Jonathan talks about how he became interested in wasted food, how it has affected his life, and what individuals and companies can do to create less food waste. Jonathan Bloom has discovered that an occupational hazard of being a food waste expert is that dinner parties can get a bit awkward. How did you get interested in the topic of wasted food? I come from a background and a family of appreciating food. Growing up, in my nuclear family, we’d all have dinner together every night and go out to eat a fair amount. Sometimes, we even planned vacations loosely around where we’d end up eating. I have that love of food ingrained in me. When I started working as a journalist, I gravitated towards food, and then more specifically food waste. Volunteering at a food bank in D.C. called D.C. Central Kitchen really opened my eyes to how much food isn’t eaten in this country. As a journalism student at the time (I was getting a Master’s in journalism at the University of North Carolina at Chapel Hill), that was a topic I latched onto and have been working on ever since. What was it that you saw at D.C. Central Kitchen that motivated you to action? Just looking at the bulk donations and talking to some of the people working there, I figured out where the food was coming from and that it was really nice stuff. It was food that would have otherwise been thrown out if there wasn't a food recovery group in that area. Seeing a real positive, progressive organization like D.C. Central Kitchen made me think about all the places that don’t have a group like that in their area and all the food in that area that would be thrown away. Specifically, it was ribs and meat and really high quality stuff that restaurants and hotels would be donating that they wouldn’t have a use for - either stuff they had prepared and didn’t serve or excess that they had ordered and wouldn’t be able to serve in time before it would go bad. On your blog, you talk about how when you first became interested in food waste, you took a job in a supermarket for a little while. How did that come about and what was that like? I hadn’t had much luck talking to supermarket people about this issue and I wanted to learn more about it. Fresh out of journalism school, I thought, “Hey, let’s get out and see things from the inside.” It was a good experience - hard work - and it was definitely tiring working in the produce department. It’s a lot of time on your feet, like most service economy jobs. But, it was definitely eye-opening and gave me a lot of insight into how supermarkets think about their business and how waste is just a cost of doing business. The other thing that really stood out for me was that individual pieces of produce were just commodities - it’s not a pear, it’s just one unit at $3/pound. They wouldn’t think twice about throwing out that pear. It’s not seen as something that’s grown by someone to feed someone, it’s seen as an opportunity to make money. If they can’t sell it to make money, they’ll throw it out without a second thought. They know that to have their stores be viewed as the paragon of freshness at all times, a lot of food won’t get used. Some of the progressive companies will donate the excess, but a lot of them won’t. Are you now doing this project full-time? I also have a job working for a renewable energy company that is looking to build facilities that create energy from food waste. I write the blog and have been working on the book in addition to that. Yeah, it was something that was almost too good to be true. I was real excited when I saw that opportunity. As you’ve done research on food waste, what have been some of the surprising things that you’ve learned? Well, I guess the most surprising thing that I’ve learned is just how prevalent and omnipresent food waste is. I’ve tried to look at all aspects of the food chain and there really isn’t a part of that food chain that doesn’t have waste built into it. People always ask me, “Where is the biggest example or the most glaring example of food waste?” I never point out one specific place because I think that would kind of do a disservice to the issue and also I’m not sure that there is such a place. I usually say it’s everywhere. Is that what’s surprising to you? I hadn’t considered it really. These days the issue of food waste is coming to the forefront a bit more. But the last two years that I’ve been looking at it, it’s almost like this giant topic that everyone refuses to even discuss. I remember reading this article in the New York Times about a labor shortage in California with the pear crop. They had these pictures of these really distraught farmers and piles of pears that didn’t get picked at the right time, so they just have to be composted or tilled under. It never once addressed the issue that this was a food that wouldn’t be eaten or that these beautiful pears would just become fertilizer, basically, at best, or compost. The picture totally told that story but the words didn’t. I think it’s a topic or issue that is in the back of people’s minds. Many people have these questions and have always wondered about what happens to that half plate of food that they declined to take home from the restaurant. I’ve just been trying to answer that question for people on the blog. Have you changed your personal habits a lot in the past two years? I definitely have. I guess I’d be a hypocrite if I didn’t. Not to say that I’m perfect or anything (some food waste is going to be inevitable), but I’ve definitely become better at planning and making detailed shopping lists, and I can play it pretty close to the zero waste line. 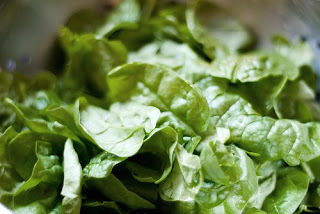 Jonathan warns that packaged vegetables often lead to waste, joking that that bagged spinach seems to go bad about two hours after opening. Photo from Flickr user Nickster 2000. What do you find is the hardest food to not waste? I guess it’s probably produce. I don’t end up cooking a lot of meat. I’m sort of a lazy vegetarian or a vegetarian out of laziness in some ways. When I do eat meat, it’s usually when I go out to eat. But, things like lettuce and cucumbers (salad ingredients) sometimes don’t end up getting used. Sometimes store selection will push me into waste. I was trying to buy spinach for a recipe and the fresh spinach they had just didn’t look good, so I ended up buying a bag of spinach (which I hate because that has a half-life of about two hours after you open it). So, that’s just one of those things that happen. I try to avoid it, but I’m not perfect. No one is. What have you gotten out of writing the blog? A lot of things. I guess, primarily, a sense of purpose and community - a purpose to spread the word. I don’t know that too many other people are out there doing that and that’s partly why I’ve grown so fond of it. I think it’s an area of need and I did see an opportunity to shed light on a topic that few others were discussing. On a day-to-day basis, I get some kicks out of the stories I find or people send me. It’s definitely a little bit awkward at times to go to dinner parties or family functions or any kind of gathering involving food. It’s not something that I try to wear at all times, but I find it’s something people have a hard time ignoring. Sometimes I worry that people see me as this big wagging finger of scolding and I show up everywhere looking to snicker and poke and prod and scold people for wasting food. That’s not exactly my outlook, just a tiny bit. Do you give people advice when you go to their homes? No, I definitely do not give unsolicited advice. It’s sort of like a job, one that doesn’t pay. I try to leave work behind in my social life. But, it comes up a fair amount. The book is in the works. It’s not imminent. I’m talking to publishers now. There’s a process that has to happen. I wouldn’t expect it within the next year, unfortunately, but hopefully soon after that. From what I hear, there’s about a year, sometimes less, but publishers take a while after you hand in the manuscript to work on all the stuff that they have to do. I’m not close to handing in the manuscript. In terms of what’s going to be in it, it’ll be a light-hearted romp through the world of food waste. Will it be a similar style to your blog? Yeah, that’s what I’m thinking. I say that sort of tongue-in-cheek, the light-hearted romp through food waste. That is kind of the approach I take. I realize that now, I do feel strongly about this issue and I think there’s a great chance to effect change and get people to cut down on this real issue, cut down on this real problem of food waste. But, I realize that no one wants to be lectured. Great interview! I love Jon's blog and it's great to see his personality come across in this interview and to read more about his background.